Hey, just wondering if anyone here does much trading. I've been trading in the stock market for a couple years or so.. I invest almost all my money that I have earned working. This year I haven't done too well. I've lost a little over a grand. Anyway, this thread is dedicated to any thoughts/suggestions about investing. Enjoy! I have a few accounts at OptionsXpress but I haven't put much thought into them for the last 2 years except in the summers. I prefer short-term trading (not day-trading, but a week to a couple months) with options or long-term options to use in diagonal spreads, and school would just get me distracted too much. I'll be getting back into it again once I have a less hectic schedule. What have yall invested in? And what do you find that is successful? Obviously the less risk involved, the more likely you will profit (mutual funds).. but what exactly have you discovered through experience? I'm afraid to trade in the stock market. Josh, I seriously think it's a bad idea to invest all of your savings in the stock market. If you want to do that, at least take half and put it into a high yield CD or money market. I trade technology stocks, primarily up and coming companies that I'm familiar with. For example, I bought Red Hat a couple of years back before the launch of RH Enterprise and Fedora. There is so much wrong with your post. It's not a matter of luck, it's a matter of education and experience. Knowing how to make money when the trade goes against you. Knowing how to make money on stocks that don't move. Knowing what signals work under current market conditions. And then doing all of those. And for the $20k courses: you could either have an awesome computer, or some idea of how to make a ton of money.... your call. It sounds kind of exciting, but seeing that I receive a 5 dollar allowance per week ;-) , it does not seem very feasible! Did I say that only luck was required? No.. it's like poker.. there is a lot of skill involved; however, luck is a major part of it too. It's much easier to win at poker when you have a royal flush than a single pair.. The same is true for the stock market. It requires experience and education, but a lot of it is also choosing the right time to invest, the right stock to invest in, etc.. luck. It requires experience and education, but a lot of it is also choosing the right time to invest, the right stock to invest in, etc.. luck. You can't tell me that there is absolutely no luck involved in the stock market at all.. If you invest in a company the day before they announce that they have found the cure to cancer.. is that not luck? Or you invest in a company that decides to all of a sudden merge with another successful company.. is that not luck? If a very successful company like Enron all of a sudden crashes, is that not bad luck? Enron's stock started turning down before it crashed. There were some pretty good signs that something was going down, if you knew where to look (especially at insider trading information). You can't tell me that anyone thought it would crash though.. except ken lay and his partners in crime. Luck is a factor in the stock market, and you're a fool if you think otherwise. Yes, I think so too.. but Infraction is trying to say that luck plays no part at all, which I disagree with..
btw, you posted twice. its like poker, as you said, takes both skill and luck, but i think poker takes more luck. all that research only enables you to make a slightly more educated guess. My job is writing software for stock traders (and other traders and analysts in the financial markets) for a consortium of major banks and trading houses (think Meryll Lynch, HSBC, those kind of names). The shortterm movements are chaotic, period. Daytraders trade on luck, betting fortunes on minute changes in the market. Unless you have the time and equipment to be able to buy and sell at a moment's notice (literally, a few seconds and the situation can have changed), you don't want to go that way. The only thing you can say about he stockmarket is that in the long run on average the stocks on it will increase in value. But you can't tell which commodities will go up or down in the short term (or even at all), or even which will survive. A few years ago "experts" here told everyone to invest heavily in Getronics (traded on Euronext Amsterdam). At the time the stock was nearing 10 Euro and rising rapidly. One bad press release later the stock plumetted to below 10 cents in a matter of days. It's now about 5 years later and the stock has recovered to about 1 Euro. Many many people lost massive amounts of money following "expert advise", advise from professional portfolio managers. If you choose to invest, invest in longterm commodities. Precious metals, land, and government bonds are good longterm investments, or choose a well spread out (different sectors, different exchanges) portfolio where losses in one stock will be compensated by wins in another. With a bit of luck you will earn more in dividends and increased stock value than you would placing the initial amount in a savings account, even after the cost of your portfolio manager. 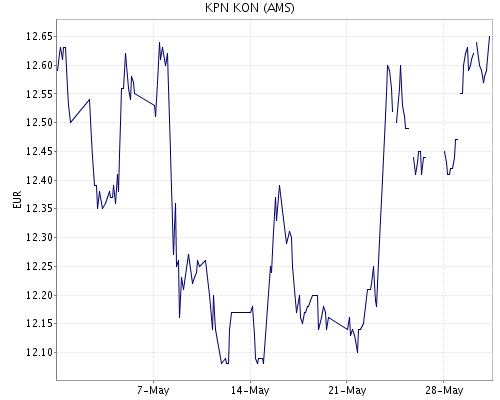 To give an example of the chaotic behaviour of stock, I've attached a plot of one commodity traded on Euronext Amsterdam. Plot shows 1 hour intervals over the last month of trading. The gaps are days the exchange was closed. Crash.com: Does the Stock Market Freefall Impact Your Job? Market capitalism: unsustainable. Do you agree?